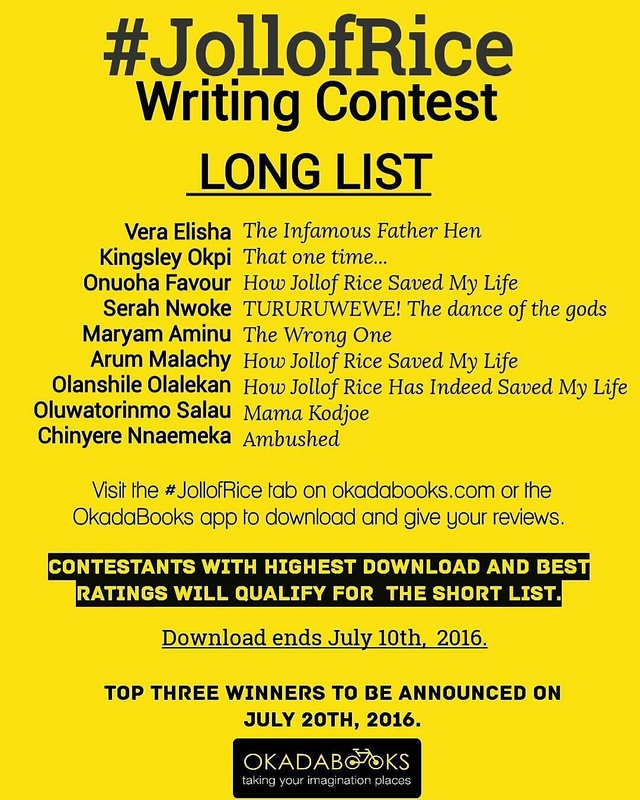 At Just three day to wrapping up the second stage of the on-going OkadaBooks #JollofRice Writing Contest, the contestants need your votes to be shortlisted for the next stage of the contest. The contestants need your votes by way of downloads, ratings and reviews to be shortlisted for the final stage. To vote, please go to the #JollofRice Contest Tab on your #OkadaBookssapp or simply log on to okadabooks.com to download and review the entries of your favourite contestants. Download and ratings end on July 10, and contestants with the highest downloads and ratings will be shortlisted for the final stage. Thanks for riding with OkadaBooks. Next Next post: Headline News – Thu, 7 July 2016: Former Presidential Aspirant, Shinkafi Is Dead!